Chatter and laughter filled the Knuth Hall theatre as musicians tuned their instruments for a night of classical music during the 50th anniversary of the Frank V. de Bellis collection. 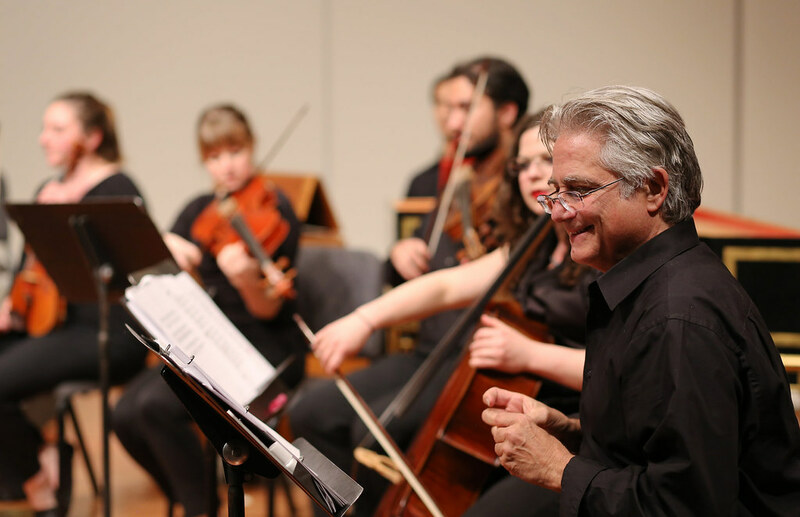 The celebration was held at the J. Paul Leonard Library and College of Liberal Creative Arts Thursday, Feb. 27 and Friday, Feb. 28 with alumni and current students performing from this rare music collection that celebrates the Italian heritage and culture. The de Bellis collection was presented to SF State in February 1963, a year after de Bellis donated the collection to the California State University trustees. De Bellis was a resident of San Francisco up until his death in 1968, according to Christine Brandes, director of the Alessandro Scarlatti piece performed Thursday Feb. 27. He was focused on educating people on his heritage and the rich culture of Italy. “Music of the Italian Masters” radio program was one of his ways of educating the public on his culture and also having free concerts by Italian chambers, singers and scholars. Currently, the J. Paul Leonard Library has the only known manuscript in the original form in their Special Collections. Brandes, director of “Cain: The First Homicide,” an oratorio by Alessandro Scarlatti, a piece written in 1707, said that the first step to putting on this event was finding alumni who were available and familiar with Baroque chamber music from the 17th and 18th century. “(It’s like having) the right tool for the right job,” Brandes said. As the performers entered the stage, applause filled the theatre, welcoming the string players: Katherine Kyme, Aaron Westman, Chase Spruill, Maxine Nemerovski, Brooke Parker, Vijay Chalasani, Whitney Smith, Scott Charles Lindorfer, John Chen and Richard Savino. Next came the vocal performers: Jose Hernandez, Angela Cadelago, Liesl McPherrin, Buffy Baggott, Eric Neff and Paul Thompson, along with Brandes. Alessandro Scarlatti’s piece was performed in two parts on Thursday. This was the age old tale of Cain and Abel, in which Cain killed his brother, Abel, prompting God to banish him after committing the first murder. “I thought it was beautiful (how the performance) came to life,” said Helene Zindarisian, 49, who came out to support Thompson, a friend of hers. The second night of the event took place at the J. Paul Leonard Library and included speeches and performances by students, professors and a local choir. It was hard to tell who stole the show on Friday’s opening and reception of the de Bellis Italian heritage collection. The second night of the show took place at the J. Paul Leonard Library and included speeches and performances by students, professors and a local choir. The afternoon began with speeches by Tony de Bellis, Frank de Bellis’s son, about his father’s legacy and vision to educate the public on the music that he loved. The younger de Bellis’ speech elicited a spectrum of emotions from the crowd of around 90 people. But the audience’s attention was quickly stolen by Alondra Orellana, the sophomore music student with a prodigious opera voice. Orellana sang the last crescendo of Ferdinando Paer’s Sei Ariette Italiane. She was accompanied by graduate student Amanda Huang on the collection’s 1802 forte piano. Even Joel Angel Juarez, a freelance photographer, stopped shooting. His shutter was too obtrusive. But it would be criminal to say that Huang outplayed her piano professor, Victoria Neve, who began the afternoon with Muzio Clementi’s Sonata in G Major, Op. 24 No. 2 on the antique Clementi Co. piano. Next, the Ut Re Mi choir, founded in 2013 and specializing in often overlooked renaissance music, sang Giovanni Animuccia’s Magnificat primi toni. The choir’s nine voices worked much like the gears of a watch. That is, one deep baritone voice initiated reactionary tenor, soprano and alto voices until unadulterated harmony ensued. The singers of the choir switched spots on various pieces, reshaping the sound in a sort of organic stereo. Meredith Eliassen, the collection’s curator, and the woman largely in charge of putting on the gallery, said that this year the most important aspect in the collection is its digitization. The digitization of the de Bellis collection began in August 2013 when DIVA, a public digital archive of previously hidden and rare material, began converting samples of various collections last summer. They began working with the de Bellis collection in November 2013, said Eliassen. “(I) hope not only will (students’) eyes be opened to the treasures in this collection and become familiar with the other collections (we) have at SF State,” Brandes said. She hopes the show will light a fire in this collection and start series of concerts in the Special Collections in the library.